Note: The Android SDK, Android Studio, the Java Development Kit, and certain other development tools are provided by third parties, not by Amazon. Our links for these tools will take you to third-party sites for download and installation of the tools. To use our SDK with your Android Studio project, add the JAR file included in the SDK package as a file dependency. 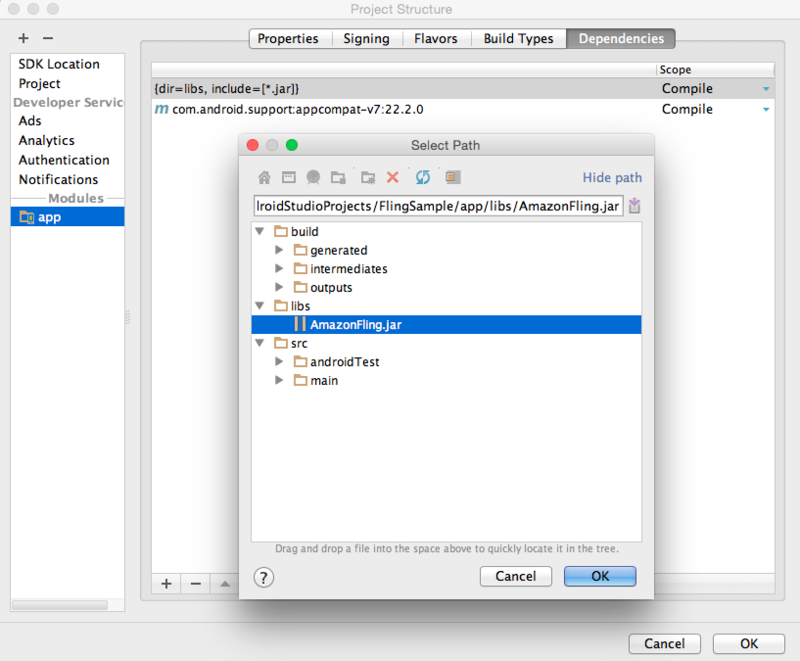 Use these steps to set up your Android Studio environment. If you are developing an app for an Android platform that does not run Fire OS, there are additional libraries to add as well. In Android Studio, create a new project or open an existing one. Copy the AmazonFling.jar file from the Amazon Fling library package into the libs folder for your project. Right-click on your project's root folder and select Open Module Settings to open the project folder. From the Module tab in Project Structure, select the Dependencies tab. Click the + button and select the File dependency option. Then, select AmazonFling.jar in the project libs folder. Under the Dependencies tab check the library scope and make sure it is set as Compile. 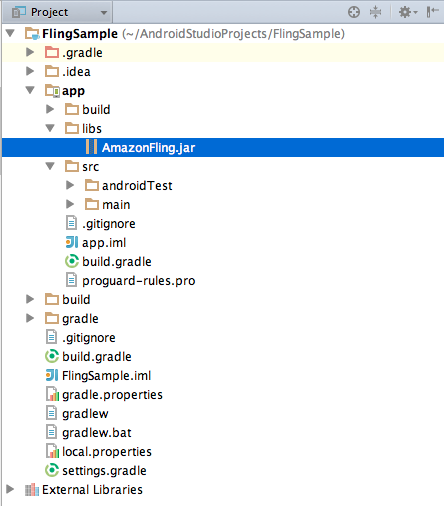 Copy the WhisperPlay.jar file in the /lib/Android/ folder in the Amazon Fling SDK package to the libs folder in your project. Right-click on your project's root folder and choose Open Module Settings to open the project folder. Click the + button and select the File dependency option. Then, select the Whisperplay.jar file in the project libs folder. To integrate Amazon Fling into your app, see Integrating Amazon Fling into your Android App. If your Android app supports the Google Cast API and you want to use Fling as well, see Integrating Amazon Fling with an Existing Android Cast App. If your app uses Android MediaRouter, see Using Amazon Fling with Android MediaRouter.